From May 26, 2018 to May 29, 2018, the external assessment team, Center for Educational Quality Assurance & Testing, National University of Hanoi conducted an official survey and evaluated the education quality of the 02 training programs: Bachelor of Primary Education and Bachelor of Chemistry for gifted students of Hanoi National University of Education. To proceed to the official survey, Center for Educational Quality Assurance & Testing – Vietnam National University - collaborated with the university to organize a preliminary survey on May 14, 2018. The purpose of the training program assessment is not only to comply with the regulations of the Ministry of Education and Training on accreditation of training programs in universities but also to form the basis for improving the training program quality. It helps adjust resources and progress to achieve the objectives and the university’s mission. That purpose also helps improve education quality for successive periods and aim at quality development in the university, as Prof. Dr Nguyen Van Minh – President of the University said in the inauguration. Based on criteria for the assessment of education programs and education programs standard according to Ministry of Education and Training (enforced with Circular 04/2016 on March 14, 2016 by the Minister of Ministry of Education and Training), there are 11 standards and 50 criteria. 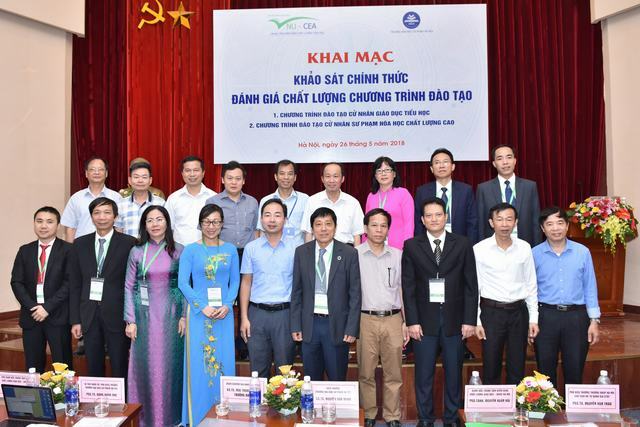 The Hanoi University of Pedagogy also participated in the process of evaluating and coordinating best so that the official survey took place most smoothly. The delegates took part in the official survey Inauguration to assess HNUE’s education program’s standard. Assoc. Prof. Dr. Nguyen Xuan Hai – the director of Center for Educational Quality Assurance & Testing, VNU presented in the Inauguration. Prof. Dr Nguyen Van Minh – President of HNUE presented in the Inauguration.